Madrid is great, is beautiful, is chic, is old but fashion, is party (becareful with the drinks!!! ), it has delicious food. Madrid is smile and love, Madrid is royal, Madrid is a very cultural city and is the home town of my favorit soccer team: Real Madrid! It’s also a museum Paradise and the shopping glory! I must say and can’t denide it: I’m crazy for the spanish clothes and shoes!!!!!!!! For starting with the right foot, he picked me up at the airpot (at 6 am!!!!!) and then he brought me to the center, where we had the best breakfast ever: Churros with Chocolate!!!! 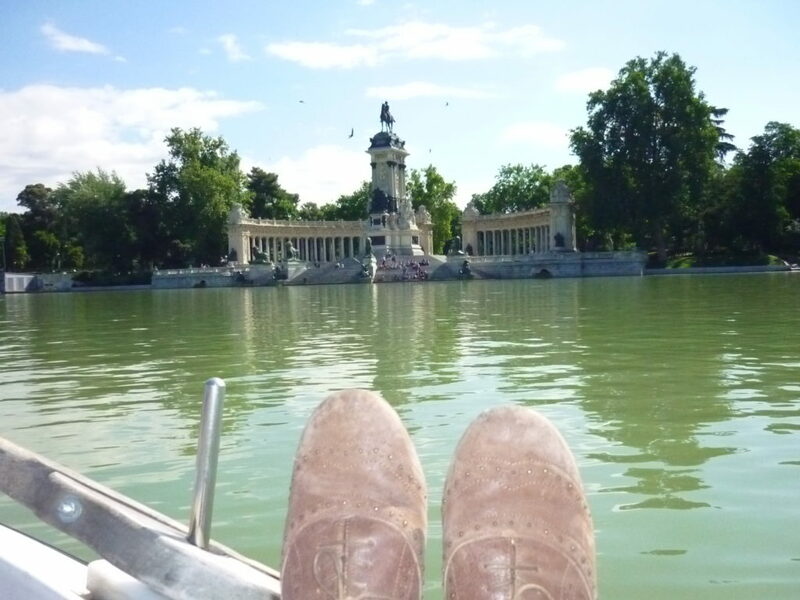 Then we went to take a walk around the city center and we took the sight seeing bus… at PARQUE DEL RETIRO bus stop, we decided to have a walk there and while we were walking, he had a great idea: going to the lake and rent a boat! It was great, we laughed so much! During 3 days he showed me so many places and faces of this city! So, Madrid… I loved it so! I felt like home and I guess it’s because I grew up in half spanish eviroment “if I can say so…” it’s that my mom comes from a spanish family, so I was raced and educated a lot with the spanish way of life… also with the German one, but we are talking now about SPAIN! I have to say that it ain’t the first time I’ve been to Spain or Madrid, but every time I’ve been here I’ve enjoyed it so much and I’ve felt like home! Now my worldwide traveling feet want to stay here!